The advanced amino acid formula aimed at protecting your muscles against catabolism (break-up). Protect your muscles today, not to hit you after huge declines in muscle mass. ACCELERATION INCREMENTS OF MUSCLE WHEN DOING "WEIGHT"
Anti-catabolic protective shield for your muscles! 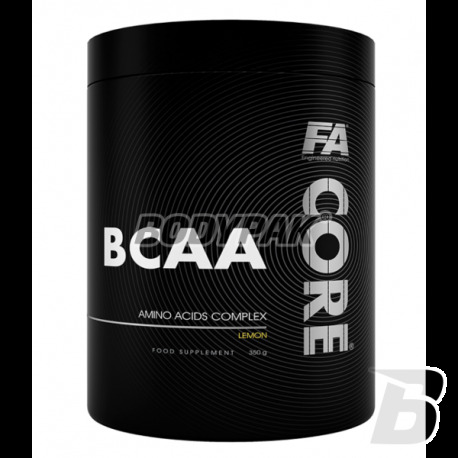 BCAA is 3 amino acids with branched side chains (leucine, isoleucine and valine) belonging to the essential amino acids, ie those which the body itself can not be synthesized and must receive them from the outside with food. The weight constitute almost 40% of the dry weight of human muscle and are thus one of the most abundant amino acids in the tissue. Supplementation with leucine, isoleucine and valine generally suggested in the mutual ratio of 2: 1: 1 as close as possible to the quantitative proportions of amino acids observed in living organisms. 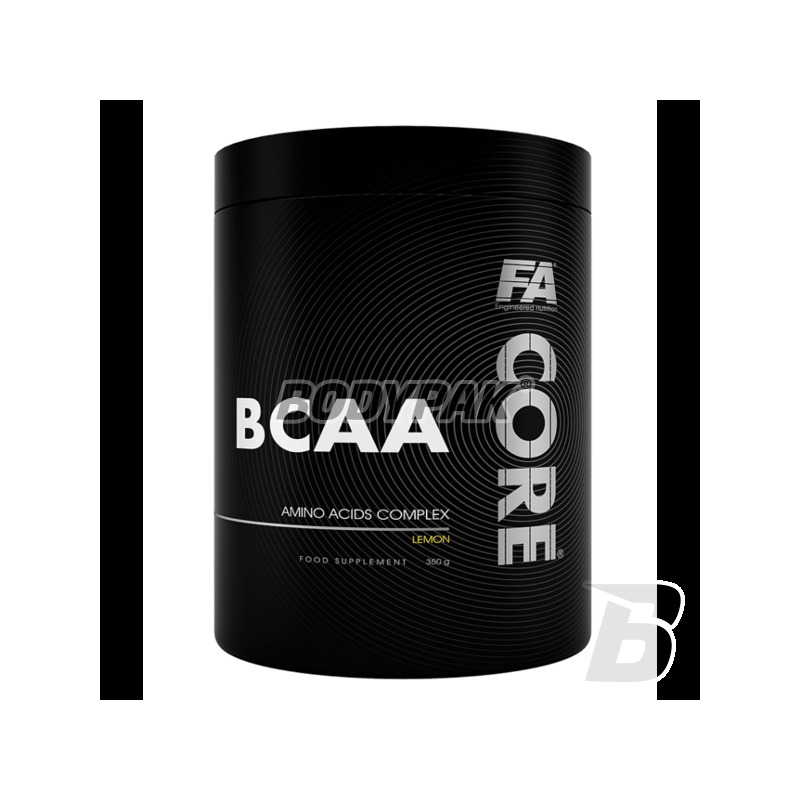 BCAA lined Core® a product containing branched chain amino acids in three different forms - free form amino acid, an amino acid salt of alpha-ketoglutaric acid and ethyl ester of an amino acid enriched with citrulline malate. Amino acids, including BCAA is strictly necessary ,, anabolic building blocks "that will build a strong and rock-hard muscle. Unlike the amino acids in the proteins of the complex products do not require cleavage product. After consumption amino acids can be absorbed from the intestinal lumen into the bloodstream and then directly supplied to the working muscles, which reduces time and energy expenditure already loaded workout. The primary purpose of intake of proteins and amino acids is their use of anabolic processes for the synthesis of proteins of the organism both new and repair existing ones that have been damaged due to intense workouts. In the period of increased activity when the body lacks other sources of protein they are also used as "fuel" which leads to unfavorable athletes catabolism and protein breakdown. Consumption of BCAA before training can protect the muscle proteins from breakdown, because it is the branched chain amino acids side in the muscles and in the liver are converted into glucose and can serve as an alternative source of energy. High levels of BCAA in the body during exercise may cause a decrease in production of serotonin in the brain, which helps reduce and delay the feeling of central fatigue. Składniki: L-leucyna, jabłczan cytruliny, beta-alanina, tauryna, L-izoleucyna, L-walina, regulator kwasowości (kwas cytrynowy), aromaty2,3,4,5,6,7,9,10, aromat1,11, koncentrat soku buraczanego (dla zabarwienia)3,4,5,6,9,10, substancje przeciwzbrylające (dwutlenek krzemu, fosforan wapnia), aromaty8, barwnik (E150c)11, substancje słodzące (sukraloza, acesulfam K), witamina B6 (chlorowodorek pirydoksyny), barwnik [E160a1,2,8,9, E1636, (E133*, E102*)7]. *E133, E102 - może mieć szkodliwy wpływ na aktywność i skupienie uwagi u dzieci. Dotyczy produktu o smaku: Cytrynowy1, Pomarańczowy2, Egzotyczna Malina3, Truskawkowo-Kaktusowy4, Jabłkowo-żurawinowy5, Czarna Porzeczka z Grejpfrutem6, Ananasowy z Kiwi7, Owoce Tropikalne8, Guawa-Gruszka9, Wiśniowy10, Cola11. Dobry produkt, cena mogłaby być ciut lepsza, ale czasem widać go w zestawie. Smak naturalny jest średni, jednak zawsze jest w nim więcej tego co trzeba, ale także nie ma barwników itd. High quality NO booster based on three chemical forms of arginine: alpha-ketoglutarate, pyro-glutamates and pure l-arginine! Enhances the effect of the pump training and rapid recovery post-workout. One pack as many as 120 full serving! BCAA + Citrulline is a food supplementing the diet with branched chain amino acids (BCAA) - leucine, isoleucine and valine, and enriched with citrulline malate.